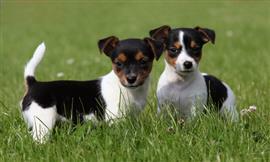 The Jack Russell Terrier comes from England along with many popular names for the breed. Males are commonly given names like Aiden, Grant, and Ethan. For a female, Abby, Sophia, and Madison are typical. The breed often carries a name related to their high level of energy. Chaos, Flash, and Turbo are a few options that emphasize this characteristic. Known for hunting foxes and rabbits, it is all too common for a Jack Russell to go down the rabbit hole. Some fun names borrowed from characters in the movie 'The Matrix' are Neo, Morpheus, Trinity, and Cypher. Other ideas can come from pretty much anywhere. Options borrowed from popular cell phones include Droid, Razor, and Nexus. Some of our pages will contain a subcategory. A subcategory is a slightly more specific grouping than the main topic of the page. For a subcategory, we will include a separated table of names and corresponding descriptions. An example of a subcategory of Red Dog Names would be 'Dog Names Inspired by Red Wines'. If you have any subcategory ideas for the Jack Russell Terrier Names page, we would love to hear them. Use the form below to submit your ideas.